Hello lovelies! It seems like time is flying by like crazy now that we're near Christmas and I can't wait to do all my Christmas shopping. Here are my Homeware and Gifts picks for the week, I hope they give you some Christmas gift inspiration of your own! 1. Nutcracker Advent Calendar £16.00 [x] : In this lovely little Advent Calendar, you get 23 charms to add to your own charm bracelet (included). It's a perfect and fun little way to countdown to Christmas without breaking the bank. 2. Bunny Shaped Lamp £39.99 [x] : This cute bunny shaped lamp, lights up in a rather unusual way with the bunny's tale being the actual lamp. 3. Dachshund Anatomy Cushion £34.95 [x] : Designed by Sophie Corrigan, this quirky cushion will teach you the 'mock' anatomy of a dachshund from the 'snifftip' to the 'jiggle-wiggler.' Perfect for dog lovers or anyone who wants to add a bit of quirky cute to their home. 4. Hamburger Gourmet £11.99 [x] : This Hamburger recipe contains 58 recipes that explore the latest Hamburger trends covering every aspect of a burger (from the buns to the sauces). 5. Set of Four Reindeer Tea Light Holders £10.00 [x] : If you want a subtle, but cute way to add a bit of Christmas to your home, the reindeer tea light holders are perfect. 6. Pug Mug £9.00 [x] : I'm starting to realise that I post an awful lot of pug related things on this blog, see past 'Weekly Homeware/Gifts Posts' to see what I mean. But can you blame me when it's this adorable? Thanks for reading and make sure to comment below! Hope you're having a great day lovelies! 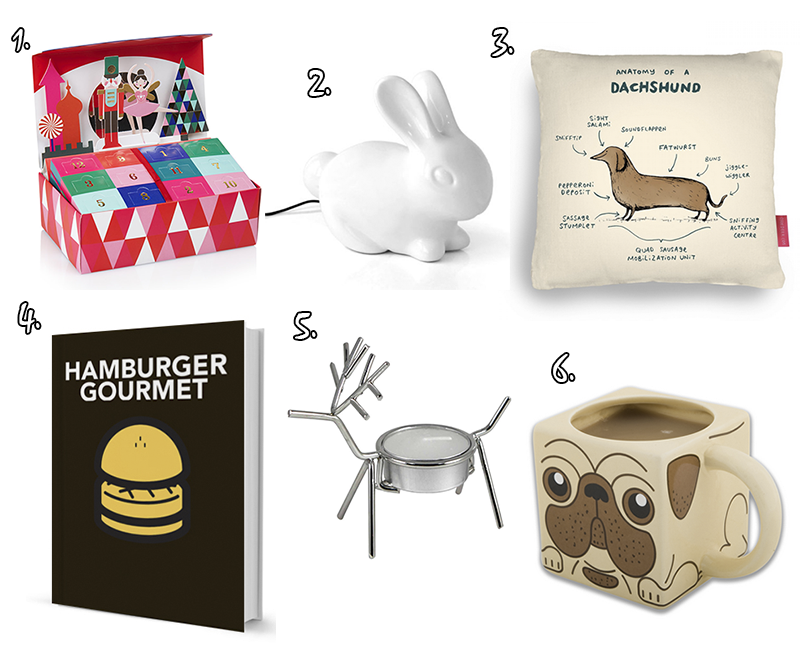 That rabbit lamp is just too cute, would be perfect for little tyke's room! That lamp!!! Ah, I love it. I have an owl one in my bedroom that it would go perfectly with. Love that pug mug, its so cute. we're obsessed with that pug mug, it's adorable!! Love the idea of the advent calendar! Me too, I sort of wish that I'd bought that one now! The mug is so cute! I love it! Me too, I'm constantly lusting after those cushions but they are really expensive! What is it with all the pug love going on at the moment??? There was an entire section in one of my favorite stores dedicated to them! Haha I just don't get it?? Have I been living under a rock!? Haha, I think it's like the moustache craze it sort of came out of nowhere! Me too, although I reckon I wouldn't use it that much if I'm honest! I know, it's so damn adorable! Yeah, I was surprised it wasn't a bit more expensive to be honest! I know, it's so adorable!